A former Fed governor says the Fed is basically running a laboratory experiment on what drives inflation. Of course that terminology probably doesn't sit well with most Americans, who are looking to the government to fix our economy, it is close to the truth. Beyond the laboratory experiment, though, there is a potentially bigger problem with the Fed. It is looking more and more like the Fed's independence is being squandered...again. There is a reason why the Fed was made independent, and it wasn't to succumb to every whim of the Federal government. For more on this, read the following article from Tim Iacono. With growing optimism that the worst may now be behind it for the U.S. economy, a growing number of observers are starting to look at what sort of an economic landscape might take shape should the optimists be right, given all the money creation over the last year or so to bailout financial firms and effectively nationalize the mortgage lending industry. According to Allan Meltzer, one of the world's foremost experts on U.S. monetary policy, the outlook is not good and it has much to do with the historical role of the Federal Reserve as an independent organization as described in this report at Bloomberg. Meltzer says political pressure will prevent Bernanke, 55, and fellow policy makers from withdrawing liquidity quickly enough as the economy recovers. That’s similar to the pattern that occurred back in the 1970s, he says. 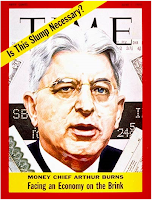 Then-Chairman Arthur Burns allowed excessive money-supply growth because he was unable or unwilling to resist pressure from President Richard Nixon’s White House to hold down unemployment, leading to the “great inflation” of that era, he says. It really is too bad for the central bankers of the world that the labor market is a lagging indicator. During the latter stages of a recession, when other economic statistics begin pointing unambiguously upward, job losses generally continue at a healthy pace and this can make reining in easy money an exceedingly difficult task. That's one of the most important reasons why the Federal Reserve was created as an independent organization - to do what's best for the economy in the long-term regardless of the political whims and wishes in Washington. Anyway, with many now seeing "green shoots" all over the landscape, the inflation/deflation debate looks set to heat up once again, and Fed policy is right in the thick of things. “All that money is going to find a home,” says Ken Mayland, president of ClearView Economics LLC in Pepper Pike, Ohio. He sees oil prices increasing to “$80, $90, $100 before the end of next year” from $52 a barrel now. Commodity prices may be more prone to rise as the world economy recovers because tight credit and volatile pricing will discourage investment in new supplies, says Mark Zandi, chief economist at Moody’s Economy.com, in West Chester, Pennsylvania. Some Fed policy makers seem more worried about deflation than they do about inflation. A sustained fall in prices can debilitate the economy by causing consumers and businesses to postpone purchases. “For some time to come, disinflation, and even deflation, will represent greater risks than inflation,” San Francisco Fed President Janet Yellen said in a speech on March 25. At the root of that concern is substantial and growing slack in the economy, which, according to White House chief economist Christina Romer, is operating 5 percent to 10 percent below potential. That means the economy will have to grow a percentage point above trend -- reckoned by the administration to be about 2.5 percent annually -- for five or more years before the slack is used up. The Phillips curve -- developed by economist A.W. Phillips using Keynesian concepts -- posits that such excess will reduce inflation as firms stuck with idle capacity cut prices and workers facing layoffs accept smaller wage hikes. “How it turns out will do a lot to influence the economic debate,” he says, adding that his money is on Bernanke. How it turns out will also do a lot to influence whether the Federal Reserve continues to exist in its current form and whether there are major revisions to current economic theory. If the amount of inflation bears any resemblance to the size of recent asset bubbles or the volume of money printing deemed necessary to combat their bursting, there may be a wholesale rethinking of what a central bank is and what economists do.